Which Shark Upright Vacuum Is The Best? Is it the Rotator or the Navigator? 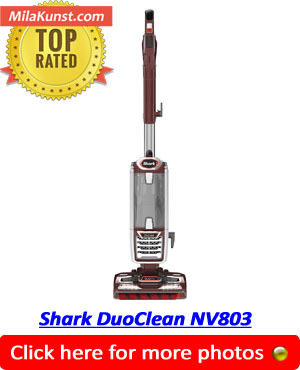 We compare the NV501 with the NV356e, two of the highest reviewed Shark vacuums, to see which is the best. If you’re looking to purchase a vacuum cleaner, it can be quite difficult to decide between the Shark Navigator and Shark Rotator. These vacuum cleaners are some of the best and most professional looking upright units in the market, and since they’re manufactured by the same brand, they tend to be similar in certain aspects. Both models and ranges have been around for quite a few years. They are testament to the quality and build or the original Shark vacuum cleaners. For example, the Shark Rotator and Shark Navigator both feature HEPA filters for preventing allergies. 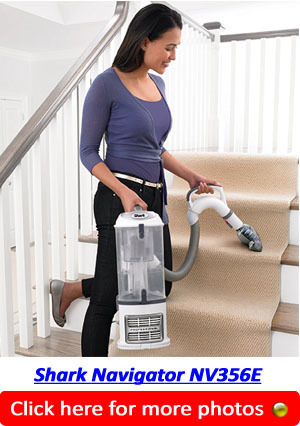 They also come with the “No Lose Suction” and tight seal canister technology, which means that you can use these vacuums on bare floors such as hardwood and carpets. 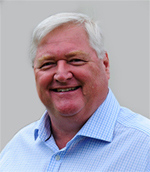 Shark also offers a five-year warranty for both units. Despite the similarities, the two cleaners do have their differences. Let’s take a closer look at the differences in features and find out which vacuum is better in my comparison chart where you can see the models side by side. One of the most important features when it comes to buying a vacuum cleaner is the ease of use it offers. The last thing you’d want to do is haul a heavy unit from one place to another while cleaning your home. You’ll also be frustrated if your vacuum only covers a small area. The Shark Navigator and Shark Rotator both come with a Lift-Away pod that turns them into portable units when taken apart. Each vacuum features a 30-foot cord, making it easy to clean large rooms without having to consistently bend down, unplug, and plug in the vacuum machine from one power socket to another. The Shark Navigator weighs 13.7 pounds in total, while the canister is only 8 pounds. The construction features lightweight materials to make vacuuming less straining on your back. 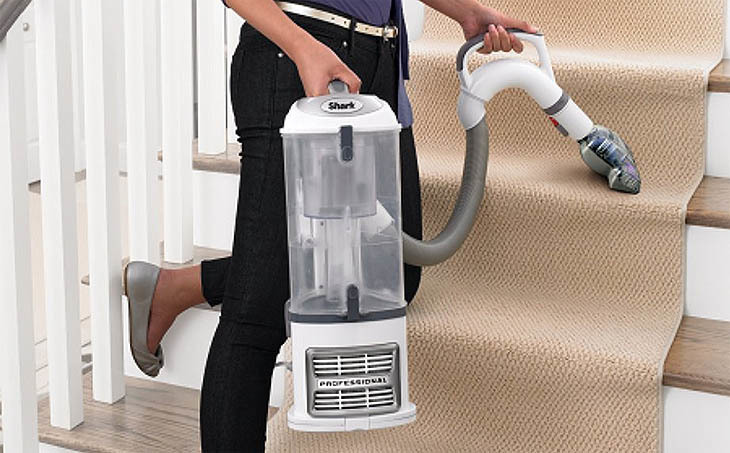 This vacuum also comes with an extra-large 2.2 quarts dust cup that empties easily. Weighing a total of 15.5 pounds and 8.4 pounds for the canister, the Shark Rotator is slightly heavier than the Shark Navigator. However, it’s still pretty lightweight and pushing the machine around while cleaning will not be too taxing on the body. A lightweight design also means that you don’t have to strain too much when climbing flights of stairs with a portable canister in hand. The dust cup is only 1.3 quarts. What makes the Shark Rotator stand out is the addition of headlights on its cleaning path and base. These lights come in quite handy when going over dimly-lit areas in the house. It’s a tough call to decide whether the Navigator or Rotator is more easy to use because both have been designed with a swivel steering that navigates cleaning surfaces with seamless ease. For the Navigator, you get a larger dust cup. And for the Rotator, it features headlights to illuminate dim areas. The vacuum cleaner that you’ll find easiest to use will ultimately depend on your specific needs. Attachments and accessories can turn an otherwise basic vacuum cleaner into a versatile cleaning tool. Both the Shark Rotator and Shark Navigator are shipped and packaged with 24” and 8” crevice tools for cleaning baseboards, corners, and other small areas often missed by a larger cleaning path. Both units come with a dusting brush with bristles extending from the head for loosening pet hairs, crumbs, and other forms of dirt that remain lodged between the fibers of upholstery. Other add-on attachment heads differ depending on your chosen vacuum cleaner model. When it comes to additional accessories, the Shark Navigator features a hard floor attachment head and pet power brush. Two microfiber pads also come included in the package. If you’re looking for more attachments in a vacuum cleaner, you’ll be pleased to know that the Shark Rotator offers a wide range of accessories. In addition to the standard attachment heads, this unit features a multi-angle dusting brush, large turbo brush, straight suction nozzle, canister caddy, as well as a car and home detail kit with multiple cleaning heads depending on the chosen model. It’s quite evident that the Shark Rotator stands out when it comes to extra vacuum cleaning attachments. Keep in mind, though, that both the Shark Navigator and Shark Rotator vacuum cleaners come in several different models that determine what optional accessories you can get. The Shark Rotator and Shark Navigator machines deliver varying levels of cleanliness when used to vacuum different surfaces. Much of this has to do with the different types of cleaning technology that comes with each unit. As far as cleaning technology goes, both of these vacuum cleaners work consistently well on hard floors and carpets. However, the Shark Rotator has better suction power and this makes it ideal for deep cleaning. The Rotator also delivers better edge cleaning and has a wider cleaning path that vacuums more floor space with each push. Depending on the chosen model, the standard cleaning path size for the Shark Navigator is 9.5 inches, while some models in the Shark Rotator line have cleaning paths that measure 14 inches. While both the Shark Navigator and Shark Rotator can clean all types of surfaces, the superior suction technology of the latter vacuum cleaner makes it better for cleaning upholstery and the thickest of carpets. Which Shark Vac Is Best? 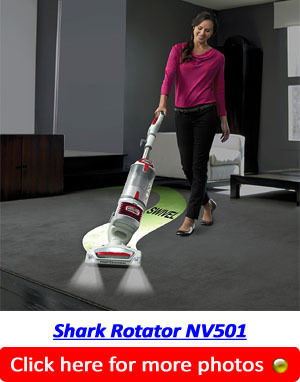 For vacuum cleaner buyers debating between the Shark Navigator lift away pro vs Shark Rotator professional, do note that the Shark Rotator offers superior cleaning features at a higher price while the Navigator comes with adequate features that can get the cleaning job done at a lesser cost. Both of these vacuum cleaners have earned plenty of positive feedback from actual users because of their high quality of engineering, superior materials used in the construction of the machine, and various convenient features. Before deciding which top rated Shark Navigator or Rotator to go for, take time to compare the features that each vacuum cleaning unit offers in order to choose the one that best suits your needs.